When Liberty Cu horseshoe nails are used on a daily basis, most farriers will notice that - unlike with traditional horseshoe nails – horses hooves stay in great condition. The horn material at the white line will be elastic and healthy, with less staining around the nail holes and the hoof wall keeps its strength. And because the copper shield is very smooth and the points of the nails are very sharp, there is less chipping on the outside of the hoof and less damage from within. After several shoeings with Liberty Cu these benefits become even more obvious. 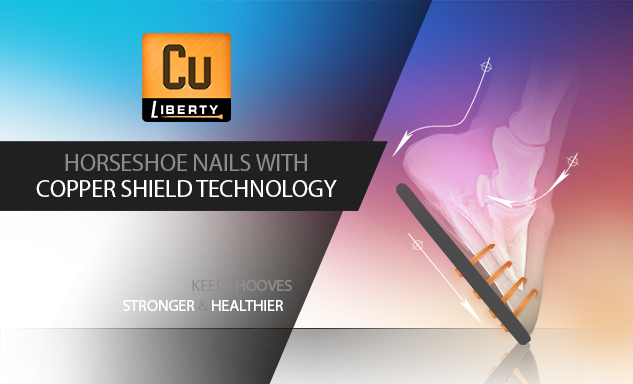 Unlike to what you might think, Liberty Cu horseshoe nails are not a luxury item. Maintaining strong, sound hooves is equally important to all horses, including every riding horse that is used for recreational purposes. Every time a farrier drives a nail into a horse’s hoof, this damages the horn material. And because traditional horseshoe nails tend to rust, this weakens the hoof wall even more.  Kerckhaert are the first to deal with this once and for all, thanks to Cu Shield Technology™. The copper shield does not rust or wear off inside the hoof wall, so horses hooves are protected for the entire shoeing cycle. Warning to farriers: All that glitters is not gold! With Liberty Cu horseshoe nails quickly becoming the new standard, we are now seeing copper coloured imitations appearing everywhere. Please note, that only Kerckhaert uses Cu Shield Technology™, which is essential for the horseshoe nails to actually ‘work’ for stronger and healthier hooves. Liberty Cu horseshoe nails are best used in combination with Kerckhaert Nail Hole Solution. This new hoof care product was especially formulated to treat old nail holes. When repeated regularly, Kerckhaert Nail Hole Solution forms a permanent barrier between the environment and healthy hoof tissue so old nail holes stay clean, until they grow out.